A warm welcome awaits you at Sheikh ul-Alam International Airport Srinagar, where you are greeted by our representative who accompanied you to the house boat at famous Dal lake where team LBR is waiting & excited to meet our riders and soon after rest and while having Kashmiri Kawa, we have introduction session and the team will brief you about high altitude riding for your smoother & memorable trip by clearing each and every doubt of you and rest of the day will spent in Shikara Ride & Lake side walk. After the breakfast, you will meet your royal enfield motorcycles and with an awesome breeze of Kashmir we’ll set start our high altitude ride with the small brief about roads and regulations. 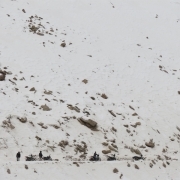 A scenic road goes up to 11575 ft., through Zojila Pass and down deep in the second coldest place know as Drass. Reach Kargil by evening. After fixing accessories and gearing up soon we will kick start towards Leh and today the route is smooth enough with two passes to cross Namikala (12,139 ft) And Fotula (13,478ft). While romancing with few breath-taking villages and throwing candies to the kids who were excited to see the biker group enroute we visit few famous places like Maitrya Buddha at Mulbik, Moon land at Lamayuru, River confluence at Nimmo and Pathar Saab etc. By the evening we’ll reach Leh. 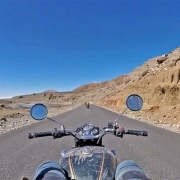 As Riders already got acclimatize by riding whole way back from Srinagar to Leh and today it’s a moment to explore magical monasteries & Stupas of leh town and in the evening a break to explore market. After a refreshing breakfast, Ride your machines for a uphill adventure towards Northwards Ladakh by leaving the town crowd behind, tracks were in gravel & paved and snowy mountains takes up to 18,380 ft. for Khardong-la pass (The Highest Motor able Road in The world) Riders goals is here and with some posses & pictures and soon interesting landscape ride take us to Hundar Nubra Valley. By catching the beautiful view of tranquil lake in the morning sun-rays we’ll set up our bike for Leh again while throttling through Chang la 17590 ft (third highest motor-able road) the scenery is simply fantastic, a little bit of off roading, crossing small streams of water and thundering over rocks we climb chang-la, and by enjoying the hot steaming black tea and by riding down from changla, you can zip through some narrow roads while enjoying the breeze and the beautiful views and soon we will enter Leh. After breakfast it’s time to kick start yours motorcycles. 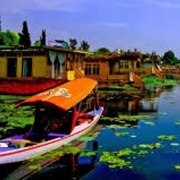 Today our ride goes along the Indus River till up to Mahi Bridge, enroute enjoy the appealing villages along the river side, famous hot springs and beautiful monasteries. By switching our right indicator we leave the valley to enter the heart of Rupshu, the most isolated part of Ladakh. 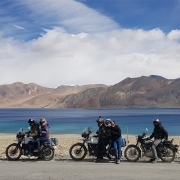 By taking sandy and rough track with our off riding skill we reach the second most important lake in Ladakh that is Tsomoriri lake 15075 ft above mean sea level. 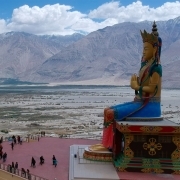 Explore lake, visit Korzok monastery and look out for high altitude wildlife. Overnight camp along lake side. With morning sunshine lighten over brackish lake we set our ride for beautiful viewpoint of Tsomoriri lake and by posing some memorable click we trace our route back to Tsokar via Polokonka la pass (16207 ft) and after conquering pass we’ll arrive at a beautiful scenic lake called Tsokar (14842 ft), one really feel I had a ride of my life. An awesome blend of stark mountain, gorgeous landscape, occasional sightings of the nomadic people and their herds of yaks & goats are common throughout the route. The Tsokar lake is famous for its migratory birds for bird lovers. Overnight at Tsokar. Today is the last day of our ride and the journey is quite long today, as we have to hit Rhotang Pass (13,050 ft) to reach our destination Manali. As it’s the last night of this adventure we’ll celebrate and party with our new lifelong friends and conclude the tour with full of adventurous memories. The tour cost is estimated for mention tour, if you like to arrive day before or late departure it will cost you extra. If the cost of your group size is not mention in table, let us know for customize. 2 Riders can go comfortably without support vehicle as wll . If you skip back up let us know for deduct amount.